Are you looking for Back Strengthening Exercises? On this site you will find a comprehensive back strengthening exercises program. Next to back strengthening exercises we include stretches and mobility exercises for the back in particular stretches for lower back pain and neck tension. We have been teaching this program for over fifteen years. Our back strengthening exercises have helped our program participants to reduce and eliminate their back problems. We also have found in order to get rid of back pain and other back problems people need to know what causes them. When you know how your back problems are caused you can learn to prevent them. You will also know what kind of back strengthening exercises are good (see our movement and exercise guidelines). You quickly realise that some so called back exercises are not so good. Unfortunately there are a lot of back damaging activities and exercise programs out there claiming to be good for the back. Once you know how to avoid back damaging activities you can re-engage because you will know how to do these activities in a way that they don’t cause you problems. Back strengthening exercises are a really good idea and a lifestyle choice if you have an otherwise sedentary lifestyle or are engaged in activities that caused your back problems. Sometimes it takes as little as 15 minutes of our back strengthening exercises every couple of days to balance out the acitivities of your life that might have caused you problems before. All our participants have successfully got rid of their back problems. they are using our back strengthening exercise program. With it they have regained good core stability. Core stability describes the correct functioning of those muscles, mainly the hips, stomach and back musculature, responsible for uprightness and stability of the upper body. If muscles in your stomach are weak and/or your back muscles are tense and tight weakness in these areas can result in misalignment of the spine. This can cause discomfort and pain, often in the upper and lower back. It can also lead to increased wear and tear causing irreversible damage to the in the spine and nervous system. Therefore a central part of the program we do is to provide exercises to re-establish and maintain a good muscle balance. However, we strongly believe it is important to learn about good movement practices. That way we can ensure that not only is our exercise program is done correctly — but any other activity we engage in, too! Our back strengthening exercise program is for men and women of all ages. We use an exercise ball for many of the back strengthening exercises. 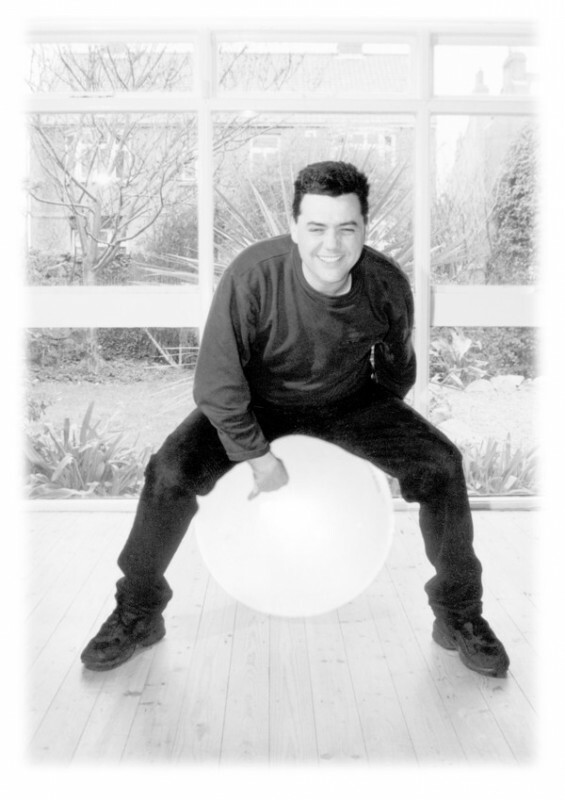 Just sitting on a ball, much like you would sit on a chair is a back strengthening exercise. This entry was posted in active sitting program, back strengthening exercises, ball exercises in work, stability ball exercises, stomach exercises, stretches for lower back pain on November 8, 2013 by flying form.